Cloudiway’s site migration solution helps businesses perform elaborate technical migrations through a simple SaaS interface. As a result, site migrations require no additional software installation or overhead, and migrations can be performed securely and quickly. The Cloudiway platform is flexible enough to support all types of migration paths. Your migration strategy will depend on your business setup, type and size. 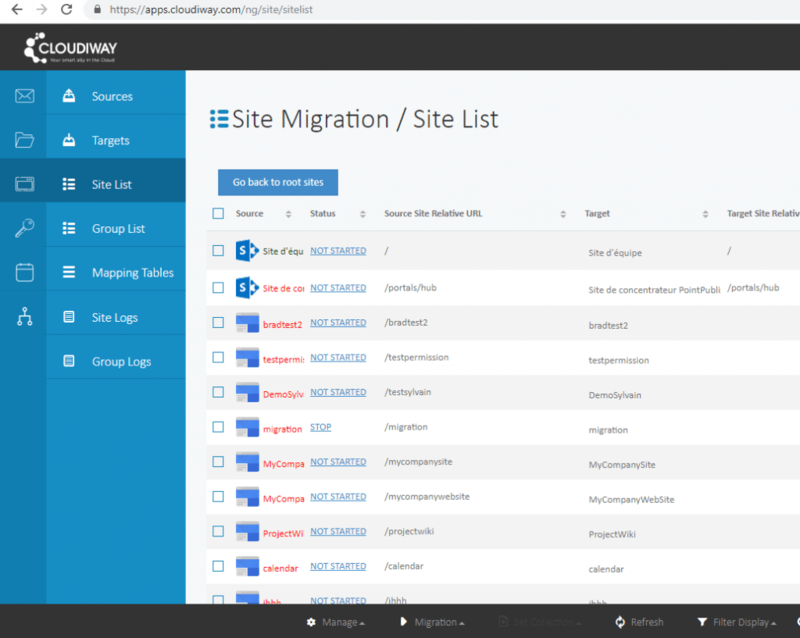 Whichever migration path you choose, Cloudiway provides all the essential features such as site content, permissions, site layout and URLs (included rewrites where required). Delta passes are also available, which means you can complete a migration to capture any changes since the initial pass. 4.1. What can be migrated? The platform supports delta migration which means that modifications (new items and updates) are propagated between passes (no deletions). Google Sites and SharePoint site are set up differently, which makes it difficult for some elements to be migrated successfully. Google Site pages are organized in a tree hierarchy where pages can contain sub-pages (such as http://www.mysite.com/mainpage/subpage. 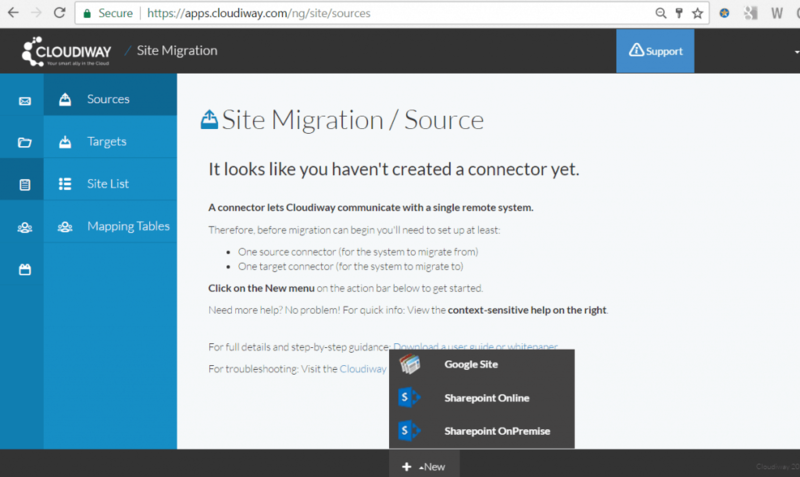 SharePoint stores each site’s pages in a flat library; to avoid page naming conflicts, Cloudiway migration platform renames Google Sites pages as ‘mainpage-subpage’. Google Site menu depth is unlimited, whereas, by default, SharePoint is limited to two nodes. By default, Google Site menus with a depth of more than two nodes cannot be migrated. The Google menu control can contain text. SharePoint menus cannot, so text content in the Google Site menu control is lost. Google gadgets that do not have web part equivalents are not migrated. Announcements are migrated to SharePoint discussion boards. However, discussion boards do not support attachments. To work around this, announcement attachments are migrated in a SharePoint library with the post title. Google Drives can be embedded in Google Sites making the migration of files, permissions and the assignment of an owner more complex than for standard migration. Prior to the Google Site migration, it is mandatory to run a file audit of all the Google Drives. This is in order to build the list of Drive documents and respective owners. Read more details about how to migrate Embedded Google Drives in this article. 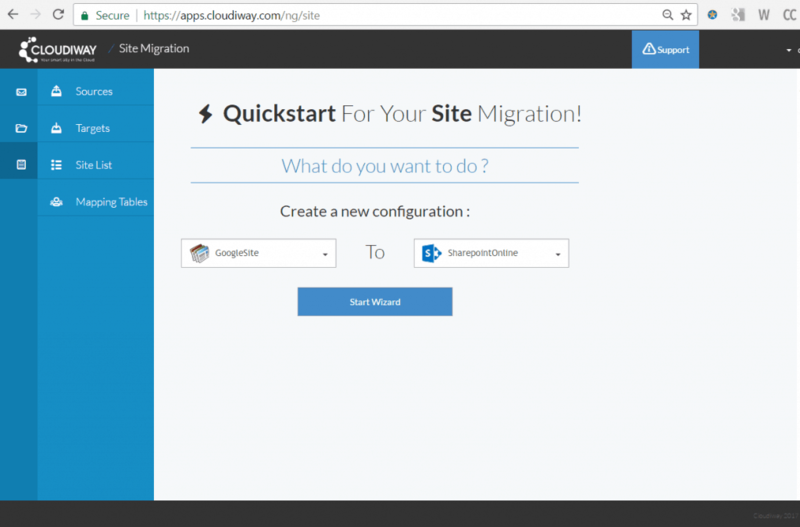 We strongly recommend you use Cloudiway’s file migration tool in conjunction with the site migration tool to achieve the best migration results possible. Please see our other documentation for more details about how these two products interact. Although we provide support for our own products, we do not provide support for third party products such as PowerShell or server administration of Google or Microsoft products. If you are concerned you might have any difficulty completing these steps, please consider a solution with our consulting team, contactable via presales@cloudiway.com. This will ensure a fast, costeffective and stress-free implementation. user@tenant.onmicrosoft.com. We recommend you create an account with admin access especially for migration. After all migrations are complete, simply delete this admin account. To ensure successful migration, we also recommend that you prepare any mapping tables for users and groups in CSV format, ready to upload later on. For programmatic access, Modern Authentication in SharePoint must be disabled. Also, the migration account (both at the source or target) must not authenticate using SSO or MFA (Multi Factor Authentication). You must define a migration account that bypasses SSO (authenticate natively in Google and Office 365) and without MFA activated. For setting up the pre requisites, you need a tenant administrator account at both the source and target. 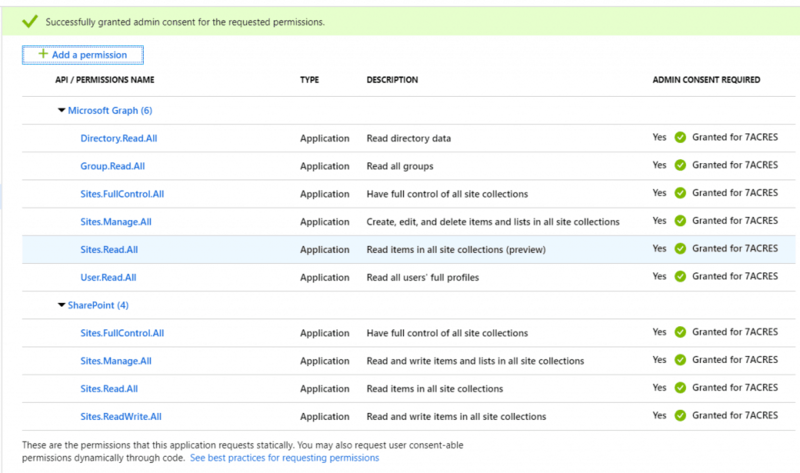 In Google, the tenant administrator account will be used to setup the service account permissions. 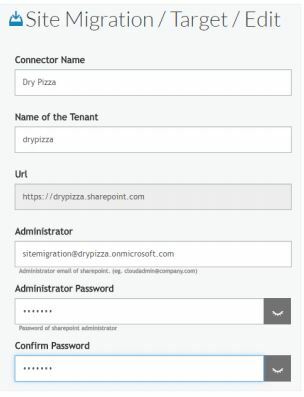 In Office 365, the tenant administrator account will be used to setup the graph API application. NOTE: 1. Each scope must be separated by a comma. 2. Some scopes require slashes (/) at the end and others don’t: please use the above strings. 3. If you add another scope later, existing scopes will be removed: you need to add the whole list at the same time. 9. Now, navigate to Security > API Reference > API Access and ensure that ‘Enable API Access’ is checked. For Cloudiway to migrate your sites, it needs to be able to communicate with both your source and target domains. To do this, Cloudiway uses connectors, which are configured on apps.cloudiway.com. You will need to set up a connector for each source tenant and each target tenant. 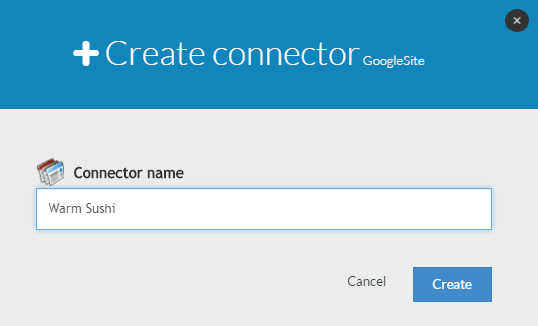 Follow the steps below to configure a G Suite source connector. Fill in the remaining details including Domain Name (no www required), Administrator (your migration admin account). 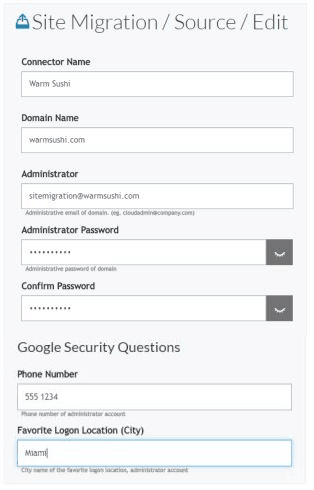 Also fill the security questions: Google will detect that the migration account will log in from an unusual location and will request to answer one or two security questions.Cloudiway would then have to log in to Google from the server in order to “whitelist” the IP address of the server. This would be necessary only one time, then the server would remain whitelisted during all the project. Click on the Save button at the bottom of the screen. Your source connector has now been created. Next up is the target connector. With the source connector now configured on the Cloudiway platform, it’s time to create and configure the target connector. 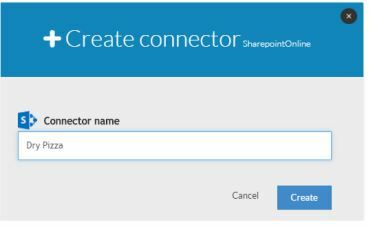 Follow the steps below to configure a SharePoint Online target connector. 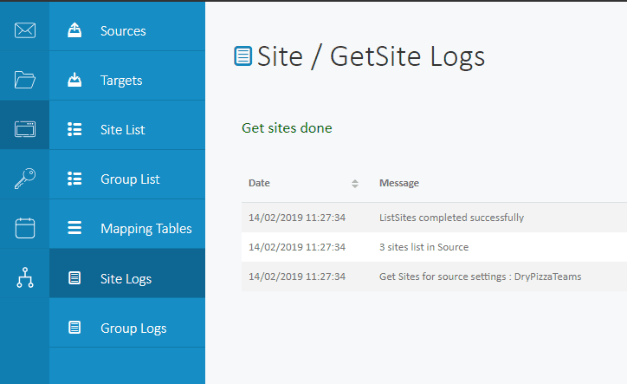 The Cloudiway platform provides a tool called Get Sites which returns a list of all sites from the domain you added to the source connector (using the admin credentials you supplied in the source connector). This is a useful tool which provides you with a complete picture of sites to be migrated. 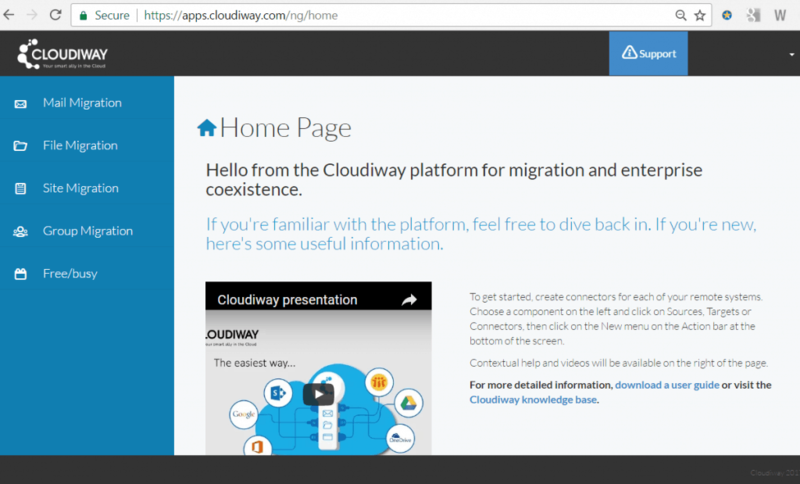 You should therefore run this tool prior to site migration to avoid having to manually enter details of each site: any syntax errors or spelling mistakes will prevent Cloudiway from finding the intended site. 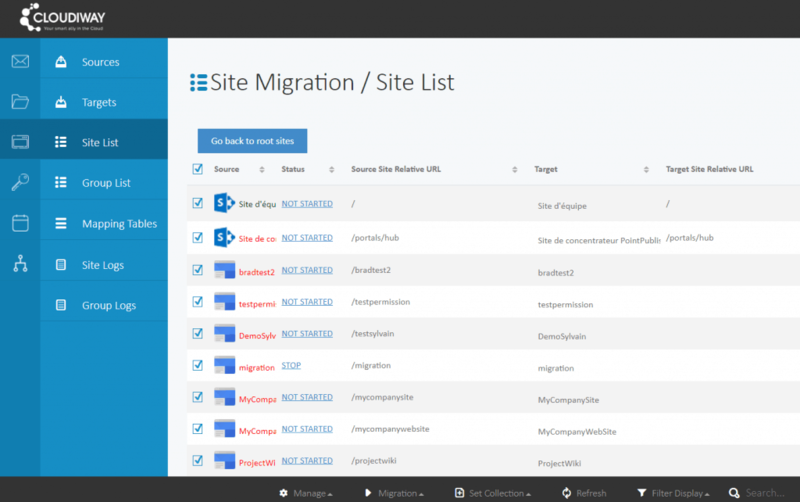 This is by far the simplest method of listing the sites to be migrated. The tool will schedule a call to your domain to return a list of all visible sites for migration. Refreshing the screen will cycle through ‘Get sites scheduled’, ‘Get sites working’ and eventually, ‘Get sites done’, presuming your source connector is set up correctly. Once the Get Sites tool has completed, it will return a list of all sites discovered via the source connector’s credentials. The list will appear in the Site List area of the Cloudiway platform. From this list, you can check what is due to be migrated prior to migration, edit the target site and collection, assign licenses and delete any sites that don’t need to be migrated. These actions are explained in the following sections. 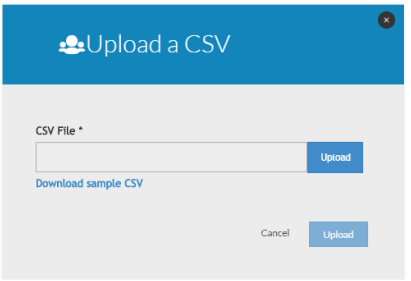 You can also download the results in CSV format for your own records or to make editing changes, and then upload the updated CSV file to the Cloudiway platform as your final list of sites to be migrated. Note: you cannot add new entries to the CSV file: they must exist on the Cloudiway platform already. 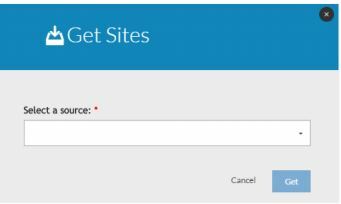 If you need to add a new sites, either re-run the Get Sites (which will add newly-available sites to the existing list) or add a site manually using the steps in section 6.1. 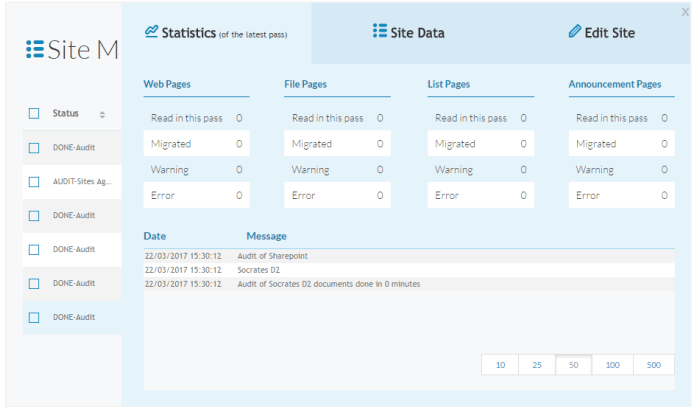 The Get Sites tool will have captured as many source site details as possible for you, to help avoid spelling mistakes or missed sites. However, it cannot specify target site details. 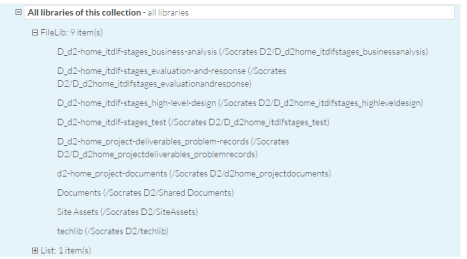 Click on the Collections tab in the top right corner to display the list of site collections defined in the Cloudiway portal. 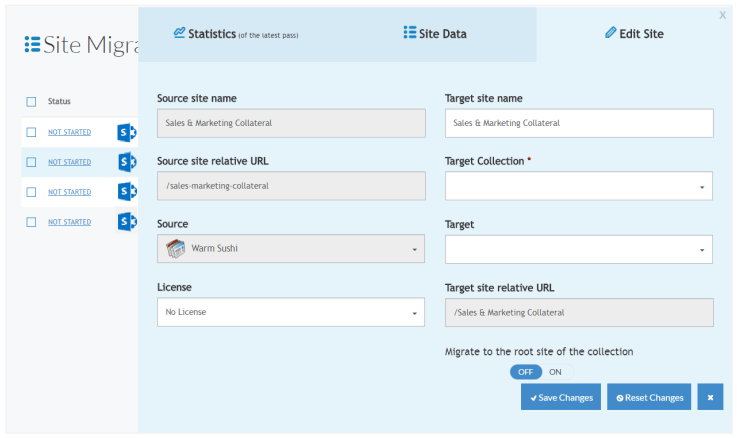 With all sources and target site collections added, you can pinpoint specific target locations within site collections to obtain your preferred site structure at the target. You can also delete sites that don’t need migration, configure individual sites and assign licenses. Before any migration can start, you must assign a license for each source site. You can purchase site licenses these within the Cloudiway platform (or contact sales@cloudiway.com for further information), and these will be displayed on the License dropdown after purchase. 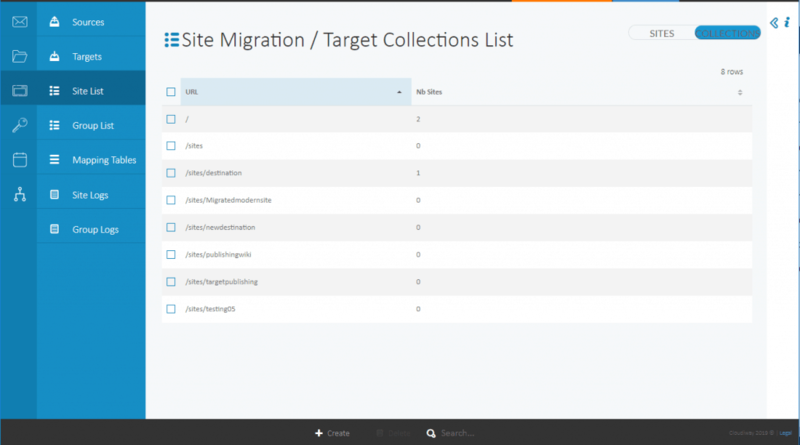 Logically, you need to add a target connector from the Target dropdown list before migration can begin, as well assign any target site collection locations to your source sites prior to migration. Remember, you can manually change each site’s name at the target, as well as choose whether to migrate directly to the root site of the collection. You can use the Target site relative URL field to preview the final site URL (relative to the target domain) each time you make a change to the target fields. 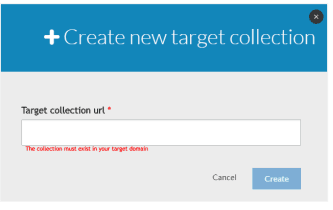 Note: You can assign a target connector and collection by entering into the details of the site and editing it (See above). You can also assign a target to multiple sites from the Action bar at the bottom of the screen. To blanket assign a connector, go to the Manage menu and select Assign Targets (this will apply to all sub-sites). To blanket assign a collection, go to the Set Collection menu and select a collection from the list. To blanket assign a license, go to the Manage menu and select Assign Licenses (this will apply to all sub-sites). In order to migrate access rights for the list of users who have access to each source site, a mapping table of users must be defined. Office 365 security groups rights can also be migrated using a mapping table. A list of mail users is used as mapping tables as it defines who has access to the different sites. It is also used to migrate metadata for files and folders. You can upload a user or site list via CSV, use Cloudiway’s automated Import Users tool, or manually add each user on the Cloudiway platform. Cloudiway provides an auditing tool which will help identify potential errors prior to migration, such as unfound sites or broken items. We recommend that you run this audit as many times as required prior to migrating to ensure your migration list is fully prepared and ready. With this level of detail about pages and contents, you can verify any troublesome items unlikely to be migrated prior to starting migration. You should also use the audit to crosscheck any missing items from the audit that are present on your source site. Note: You can change the target details at any time prior to migration, before or after running an audit, via the Edit Site tab, as previously described. It creates the site collections. It creates the sites and subsites. It creates the SharePoint libraries. It migrates the Taxonomy dictionaries. At the end of the preprocessing, the status of the migration is set to “Not Started”. The sites are now ready to be migrated. Select the sites you would like to start preprocessing by clicking on their individual checkbox, or by selecting all sites with the checkbox at the top of the list. 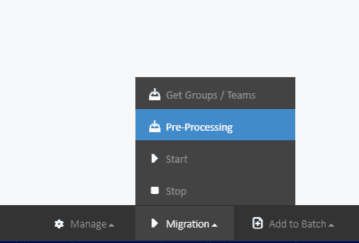 To start your migration, select the site you wish to migrate and click on the Start button. Your batch will be scheduled and will begin as soon as resources are available.